The Soundbytes HurdyGurdy is a sample based VST synthesizer for the windows platform. It recreates the sound and playing technique of the Hurdy Gurdy. The very special character of the ancient Hurdy Gurdy sound was until now very difficult to emulate. Many of the instruments peculiarities are not well known and using a sampler it is rather difficult to reproduce the Hurdy Gurdy in a convincing way even to those who are familiar with the instrument. You can now use the HurdyGurdy to play the instrument with ease. This synthesizer has been built to recreate not only the sound but also the true behaviour of the original instrument. Chanter and Drones will sound continously as long as the instrument is playing. As with the real instrument the sound will not stop when all keys are released. Instead the base key note is playing on. Playing traditional figures and ornaments is a breeze this way. Use the pitch wheel or a continous midi controler to activate the trompette buzz. Playing the trompette will also alter pitch and volume for increased realism. Use aftertouch or pitch wheel to bend the chanter note. This is done by pressing the key against the chanter string and does not influence the pitch of the drones. 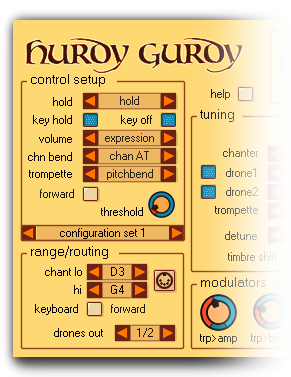 The HurdyGurdyLE is a feature reduced free version of our HurdyGurdy VST instrument. See this page for further information. The traditional Hurdy Gurdy is a very particular instrument. It could well be counted among the bowed string instruments but instead of a bow there is a wooden wheel coated with resin wich is used to stimulate the string vibration. A keybox sits on top of the instrument between the wheel and the peg box. The keys slide up when pressed and shorten the melody strings (or chanters). The keys can additionally be used to bend the strings by pressing further. The additional drone strings sound the same note continously as long as the wheel is moving. rhythmic acceleration of the wheel.